The Fiat Cr. 42 nicknamed Falco (Falcon) was a refinement of the earlier Fiat Cr. 32 who in turn was derived from the Fiat Cr. 30 created in 1932. The Cr. 42 entered service in the Regia Aeronautica (Italian Air Force) in 1939 just before WWII. It saw extensive service in most European and African theatres of war. One of the last double deckers to be used in active service. The Cr. 42 also saw service in the Hungarian, Belgian an Swedish Air Forces. The German Luftwaffe also used the planes after the Italian armistice. The Fiat Cr. 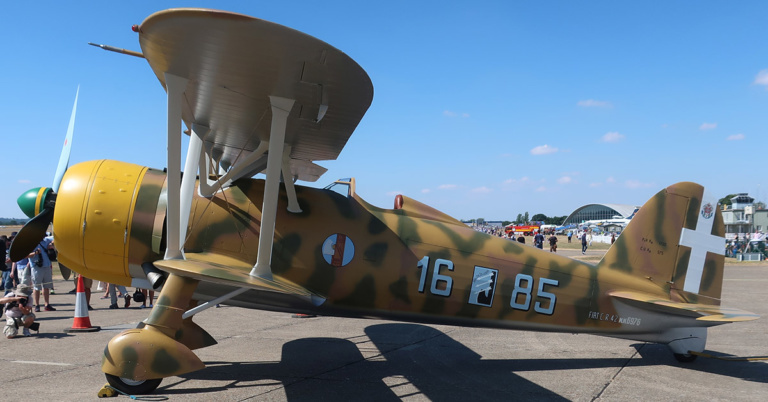 42's on this page are one Italian that was displayed outside Imperial War Museum in Duxford, UK, at the Flying Legends event 2018 and the second is the only preserved Swedish Cr. 42 that is on display at Flygvapenmuseet, Linköping, Sweden. The third is displayed at the RAF Museum, Hendon, London, UK. Building the Fiat Cr. 42 in 1/42? Classic Airframes have issued the Cr. 42 in different versions (the one I have, unbuilt, contains resin and PE parts). Italeri has also issued a kit of the Cr. 42 that has been reboxed by Tamiya and Supermodel.